At last summer has arrived, and, like the ungrateful folk we are, we’ve started sighing for respite from the sun beating down on hot city pavements. But where can you find a cool garden when you want one when you’re in the middle of London? Come with me to a hidden enclave a few minutes walk from the Strand and I’ll show you. In fact I’ll show you not just one garden but two: the gardens of the Inner Temple and the Middle Temple. 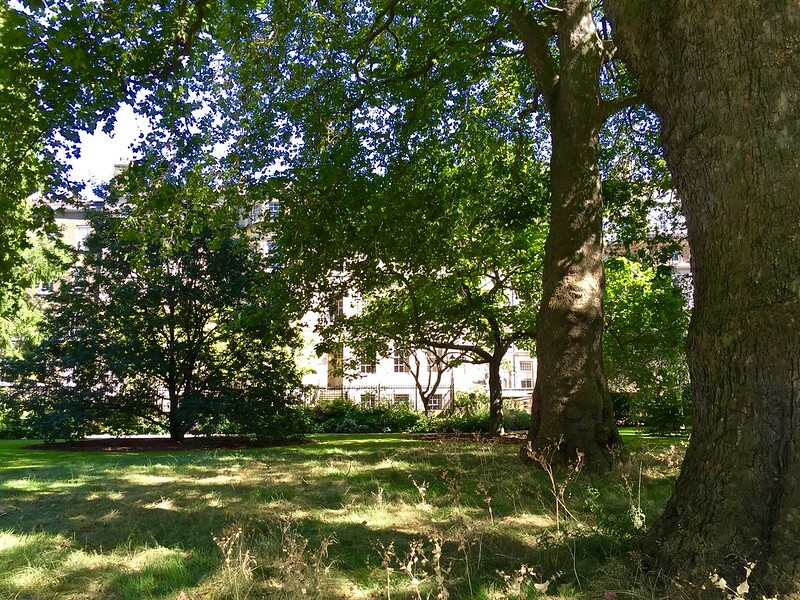 You may have glimpsed the Inner Temple Garden from the Embankment, may even have gazed longingly at its three acres of rolling lawns and its locked gate, wondering how to get in. 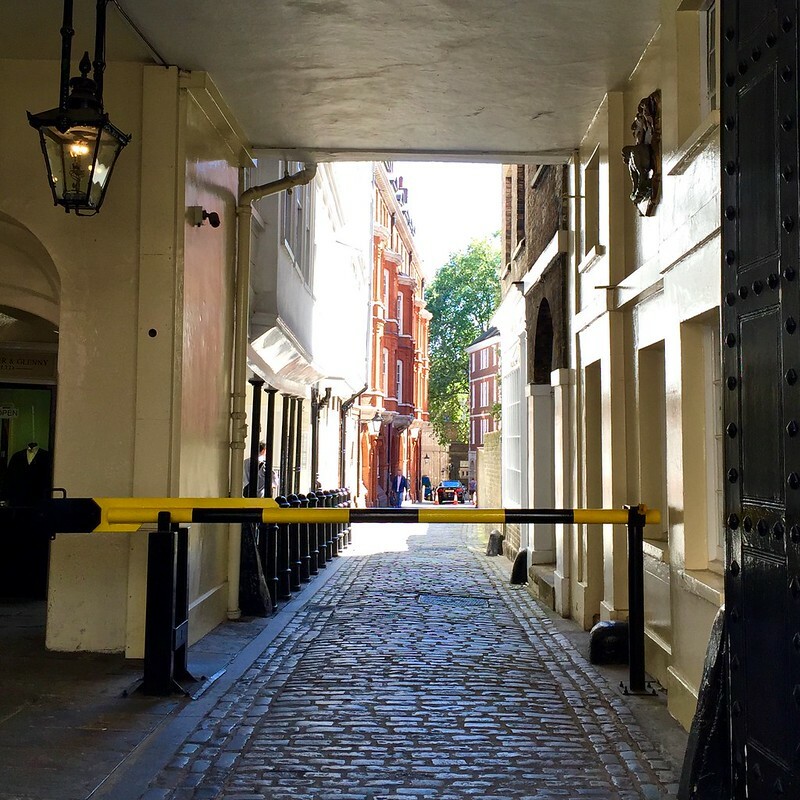 The answer is, not from here but through a quiet archway on Fleet Street. The gate leads into a maze of narrow streets and courtyards that house the Middle and Inner Temples, two of the four Inns of Court. 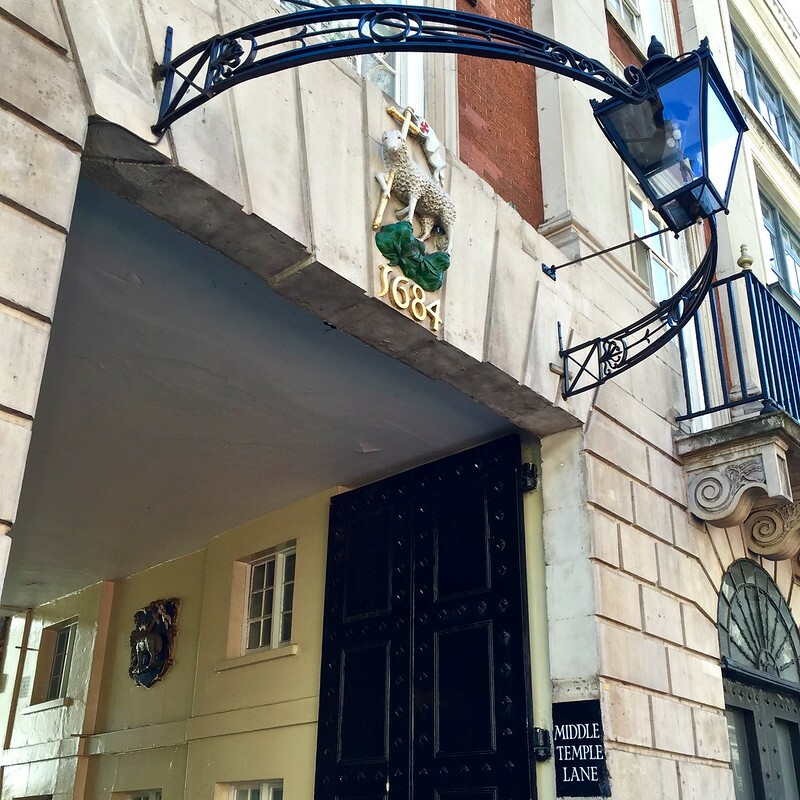 Inner Temple Gardens is open to the public between 12:30 and 3 o’clock on weekdays, but you can stroll around these little alleyways and courtyards anytime you want. 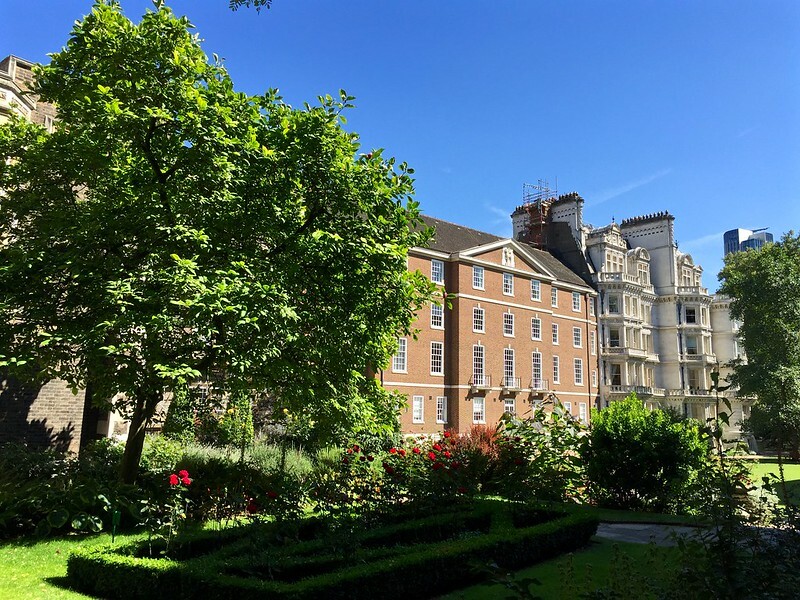 Inner Temple Gardens were laid out in 1601; Shakespeare used their rose beds as a setting for the meeting between Richard Plantagenet and John Beaufort which sparked the Wars of the Roses. 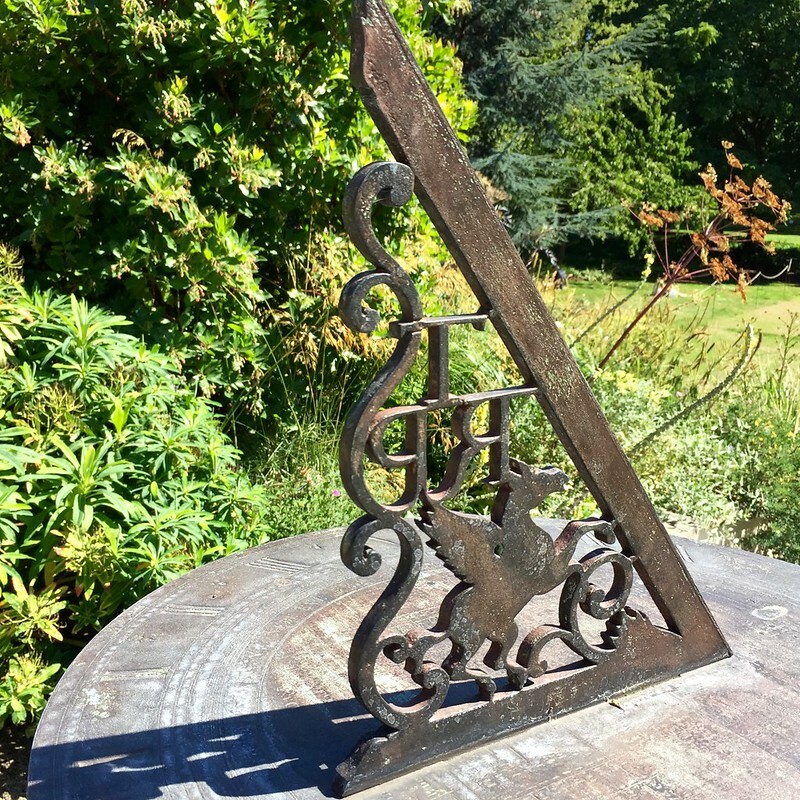 A sundial in the shape of Pegasus, the flying horse that has been the symbol of the Inner Temple since the sixteenth century, dates from 1707. 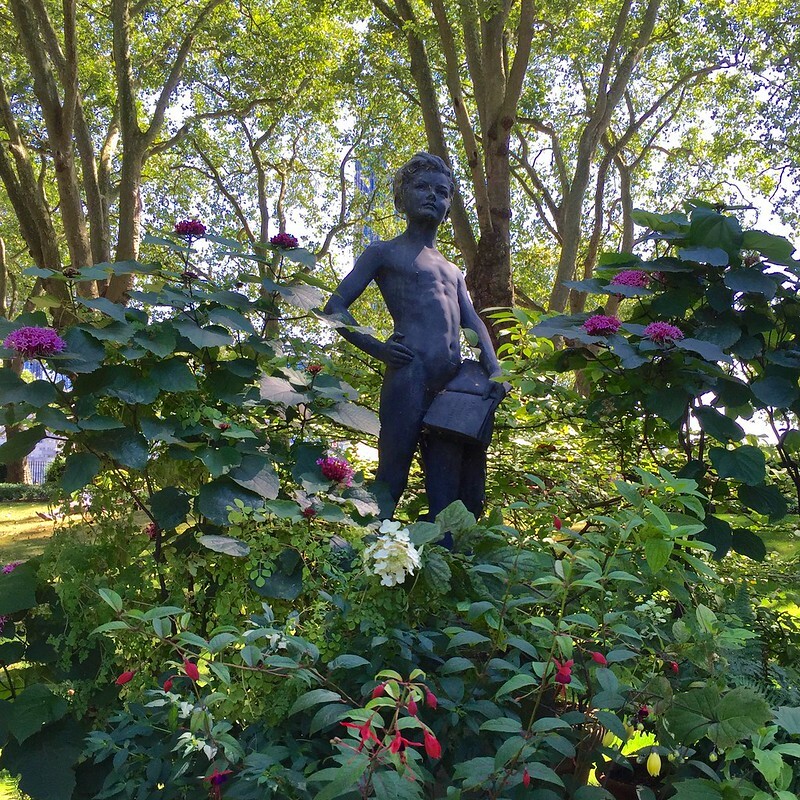 In the middle of the sweeping lawns where local workers can sit and have their lunch there’s a pond and a statue of a boy with a book open to a page which says ‘even lawyers were children once’. 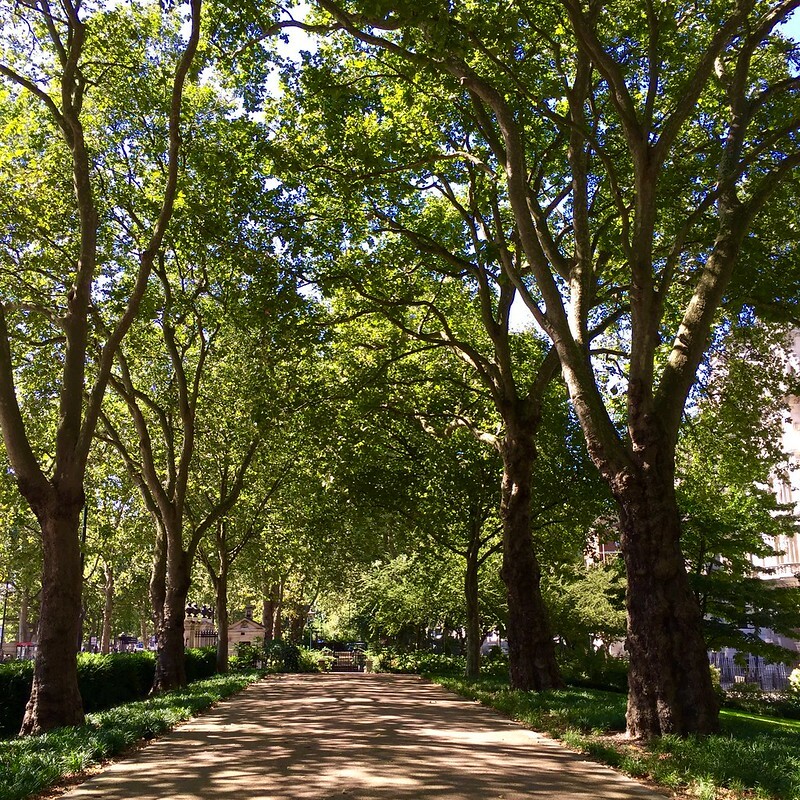 But the best part is shady walkway between plane trees with a view across the Embankment to the silvery river. 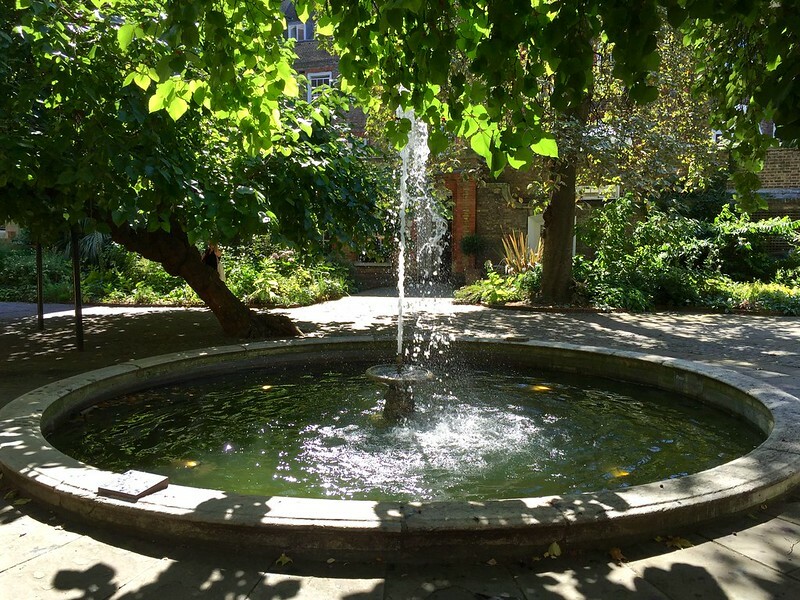 The gardens of the Middle Temple are reached via Fountain Court with its central fountain overlooked by an ancient mulberry tree. 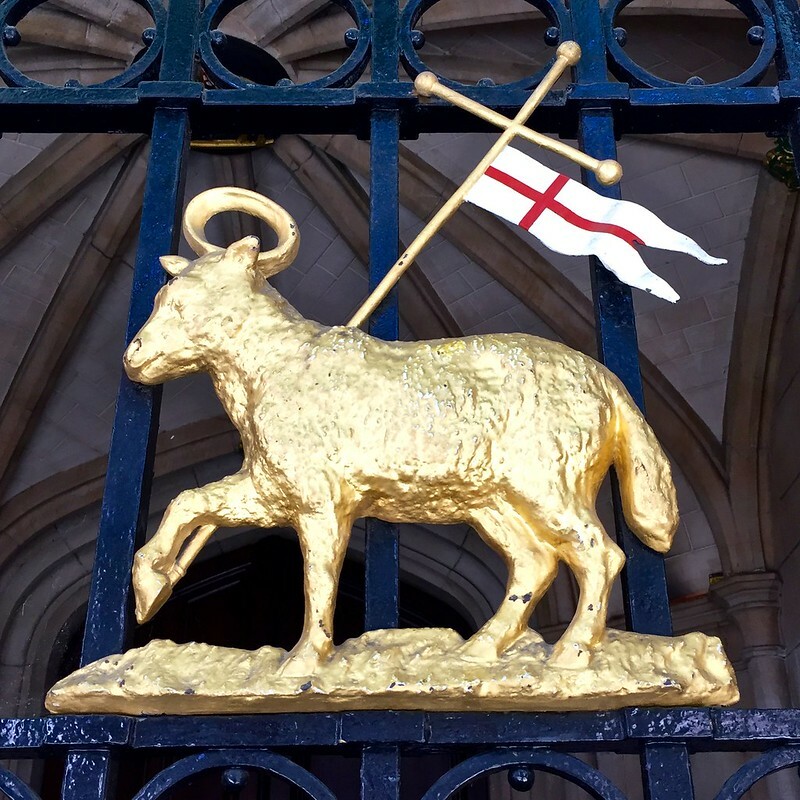 The symbol of the Middle Temple is the lamb and flag. Middle Temple Hall is a Tudor building, opened by Queen Elizabeth I in 1573, and Shakespeare’s Twelfth Night was given its first public performance in the hall in 1602. The Hall escaped the great fire of London in 1666 due to a fortunate change in the wind direction. 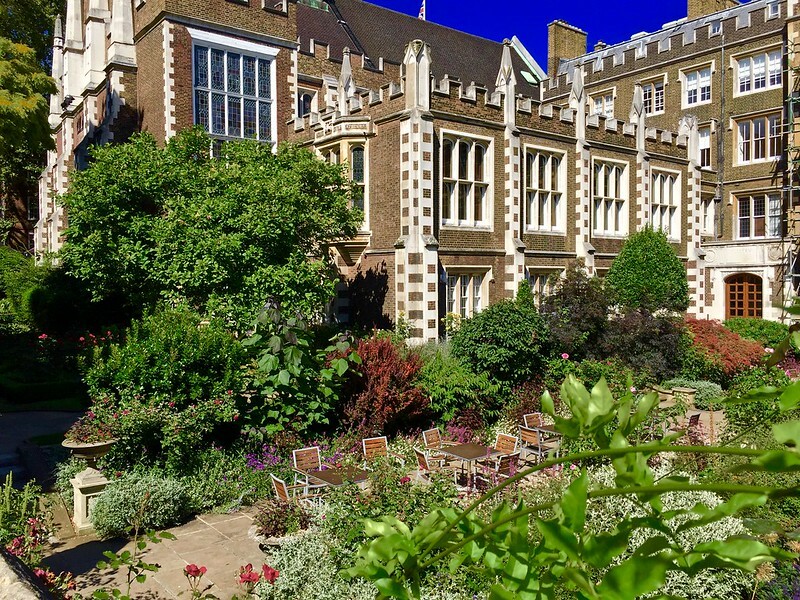 Middle Temple Garden is only open to the public in June, July and September between 12:30 and 3 o’clock, but you can get a good view of it from a little raised seating area. 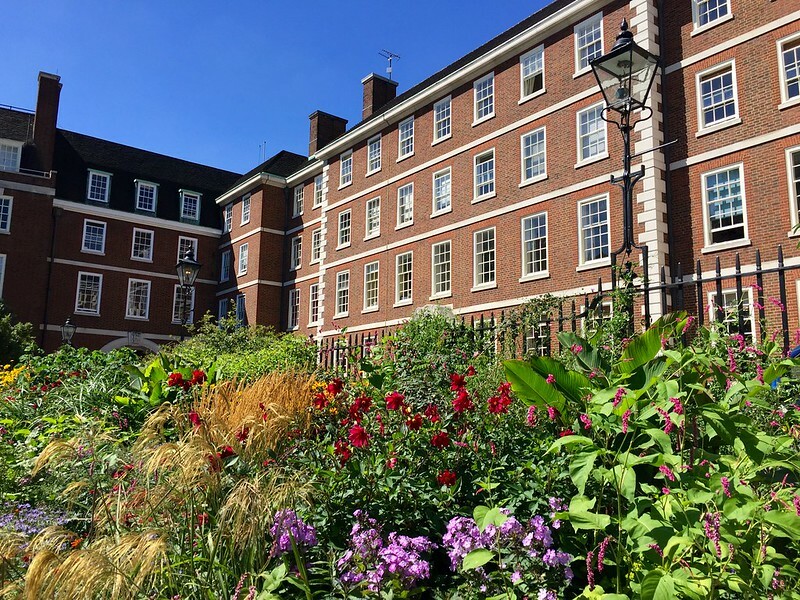 This entry was posted in Flowers and plants, History and tagged arts, gardens, Inner Temple, London, Middle Temple, nature, Shakespeare, Wars of the Roses by Fran. Bookmark the permalink. Yes, I visited with Bradshaw and loved the various Inns of Court and their gardens! This is a gem and I hope to get there. It’s lovely in the sunshine! Now you know to go inside next time!